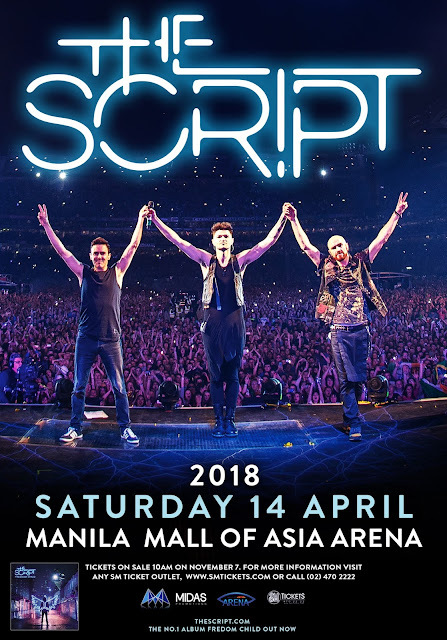 One of the world's most successful bands that anyone would really want to see them perform live, the Script, will be here in Manila on April 14, 2018 at the Mall of Asia Arena. This is their 4th time to be here in Manila and this is their one of the favorite tour destination. Here are 5 reasons why you need to be in THE SCRIPT live concert in Manila. If you're a total fan I'm you know the feeling of seeing them up close and personal or rather that much close but live performance is live performance you cannot repeat that. You may watch time and time but the thrill of being in that crowd is extraordinary. This is their fourth time in Manila but each of their visit is different so the experience would different. You'll get to hear songs from their latest album Freedom Child. Perhaps you're the only one from your barkadas who won't be there in THE SCRIPT live concert, so you be able to get along with their stories on the next day. It's vacation already and what else you'll be doing that time. So spend that one night enjoying the concert and the songs of The SCRIPT. Some short info about the band. THE SCRIPT have sold over 29 million records. The Irish three-piece have scored 3 multi-platinum albums already and all of which were #1 in the UK. In the USA they have 4 platinum selling singles. One of the biggest live bands and having sold over 1.4 million tickets across 203 headline shows and they sold out the legendary Croke Park stadium in Dublin Ireland in a matter of minutes. In the Philippines, three of their songs are charting in the Spotify Philippines Top 200. Their first single from the album Freedom Child, Rain was immediately added to playlists around the world and stormed into the top 10 on iTunes UK. The music video for Rain has been viewed over 18 million times on YouTube since it's release on July 14. Top price seated ticket Exclusive 2018 tour VIP gift The Script 2018 tour VIP tote bag Signed 2018 tour programme Commemorative VIP laminate & custom lanyard.